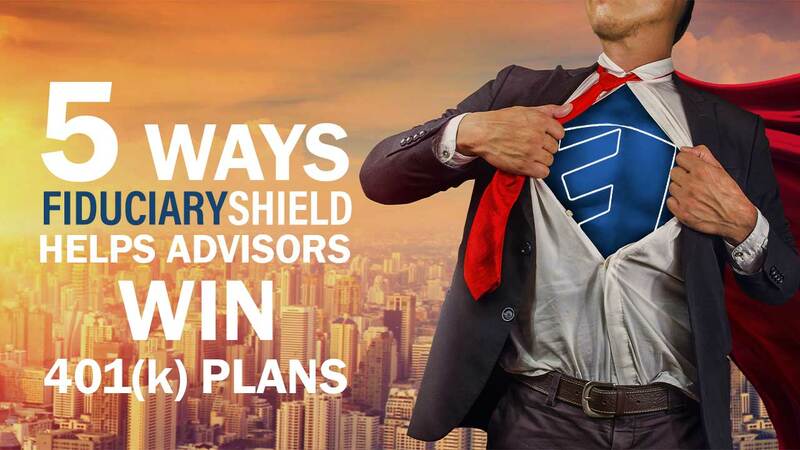 FiduciaryShield launched in 2018 to support the fiduciary requirements of those managing employer sponsored retirement plans. We are excited to launch our newest product feature – 401(k) Prospector. Registering with FiduciaryShield gives advisors access to unparalleled technology designed to support the full lifecycle of 401(k) plan management. From plan prospecting --> plan proposal --> plan onboarding --> plan monitoring – the tools you need to win more 401(k) plans are all here. We launched 401(k) Prospector this year as a tool to help advisors identify potential 401(k) business opportunities. 401(k) Prospector highlights all plans filing an annual Form 5500 within 10 miles of an advisor's office. A national plan search can also be conducted by either the employer name or plan name. Our database contains information on over 800,000 plans helping advisors identify important plan information such as total plan assets, total participants, and key plan contacts. Plan contacts are even identified on LinkedIn, giving advisors another opportunity to connect. Retirement Plan Wellness Reports are designed to help advisors identify fiduciary risk factors through annual Form 5500 filings. Wellness Reports empower advisors to be fiduciary experts by helping to identify more than 20 ERISA-specific fiduciary risk factors on a plan by plan basis. Advisors can easily identify important changes in plan demographics that may trigger the need for a plan fiduciary to review plan fees or conduct a competitive request for proposal. FiduciaryShield offers a competitive request for proposal platform allowing advisors to request proposals from more than 20 active recordkeepers. Recordkeepers who receive a proposal request through FiduciaryShield are aware they are bidding on a competitive opportunity, approved by the employer, and have agreed to customize their proposal responses within seven days of the request being submitted. Proposals submitted by recordkeepers through FiduciaryShield are presented to advisors in a simple and transparent format, allowing advisors to easily compare proposals side by side. Leveraging FiduciaryShield’s technology allows advisors to present a visually compelling comparison of a plan’s features, investment offerings, and fees. ERISA requires plan fiduciaries to put proper controls in place which support both monitoring service providers and documenting fiduciary procedures. All requests for proposal, proposal responses, forms, and reports are documented to help meet ERISA regulations. FiduciaryShield also automates quarterly and annual plan monitoring reports to help advisors and plan sponsors meet their ongoing requirement to monitor providers.